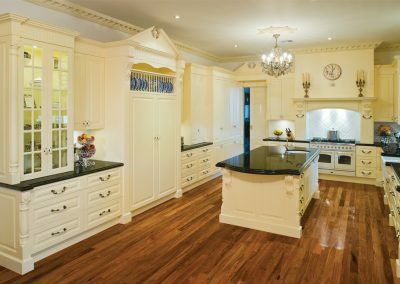 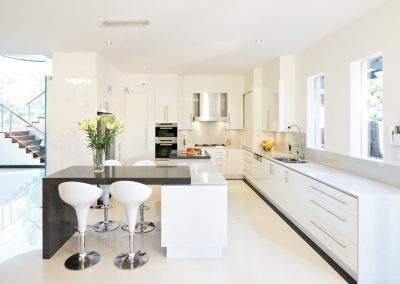 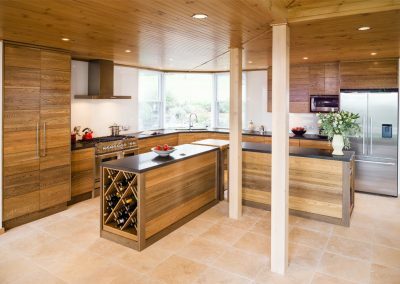 Smith & Smith Kitchens constructed this kitchen with a highly functional galley layout and integrated appliances. 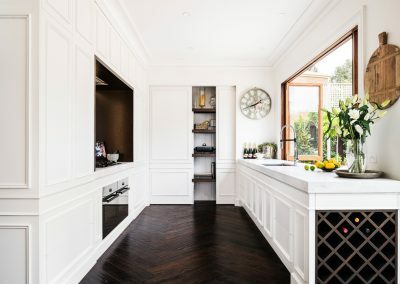 Inspired by the homeowners’ travels through Italy, the space showcases a stylish European charm. 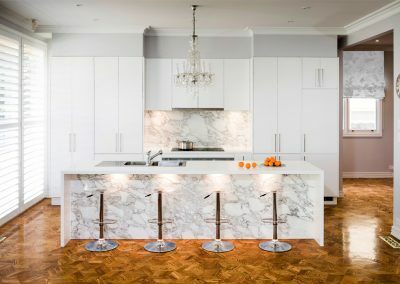 Bolection moulds were selected for the cabinetry doors, which feature a classic Dulux ‘Natural White’ paint in a textured finish. 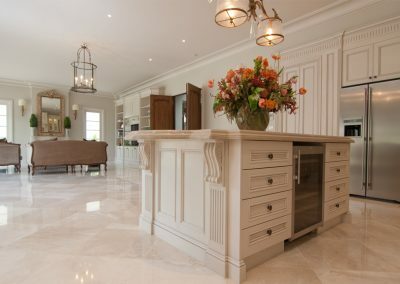 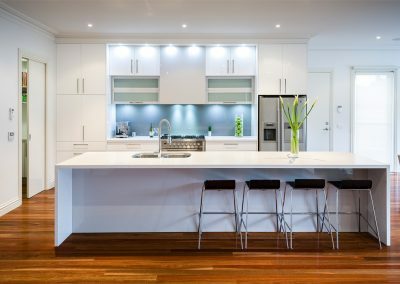 The homeowners wanted a kitchen with impressive visual appeal and clean lines, and this was accomplished by extending the cabinetry all the way up to the ceiling. 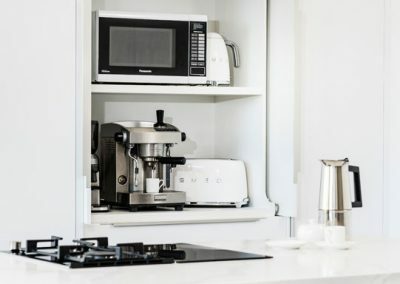 Featuring V-groove lining, Kesseböhmer pull-outs, and solid timber shelves, the compact butler’s pantry conceals larger items and small appliances. 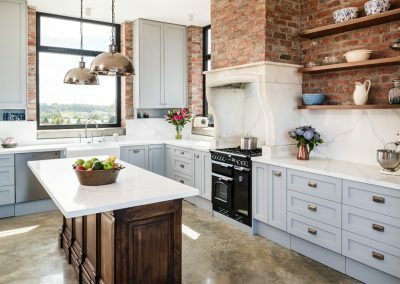 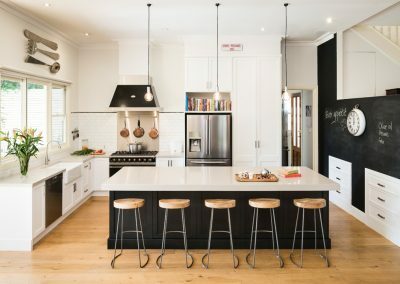 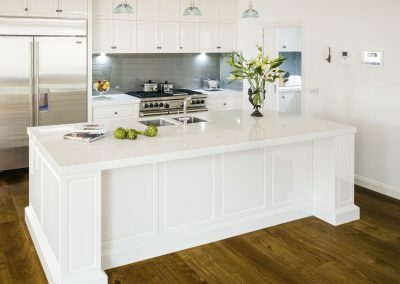 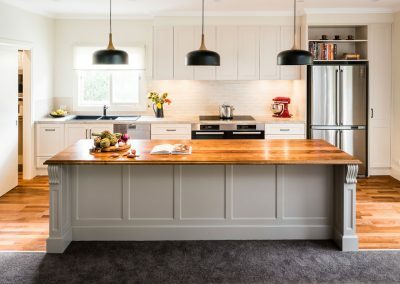 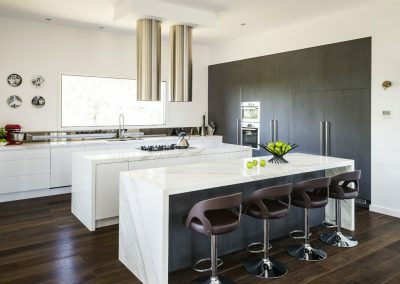 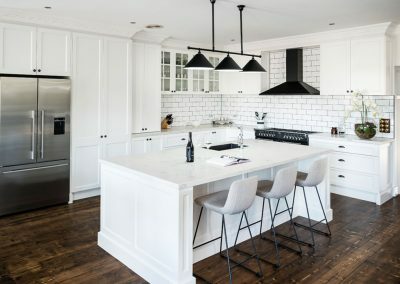 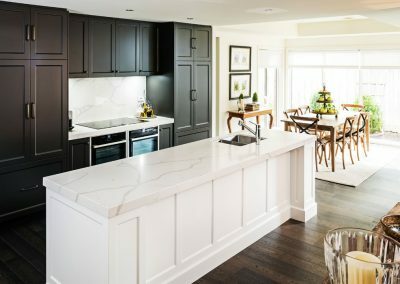 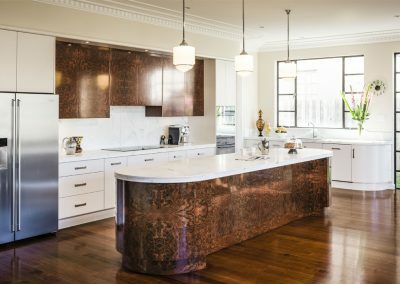 Designed with the homeowners’ love of entertaining in mind, the kitchen features a charming sliding servery window that is conveniently located above a spacious Elba marble benchtop. 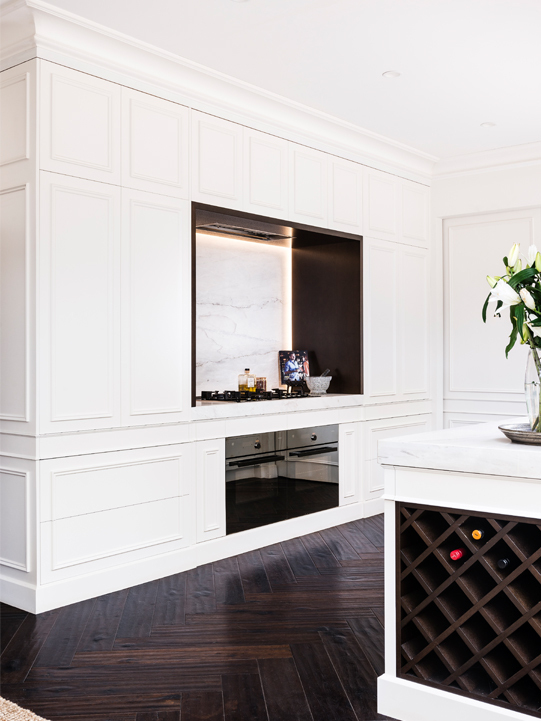 A wine rack crafted from solid timber was fitted into the side of the bench, and perfectly complements the home’s hardwood flooring. 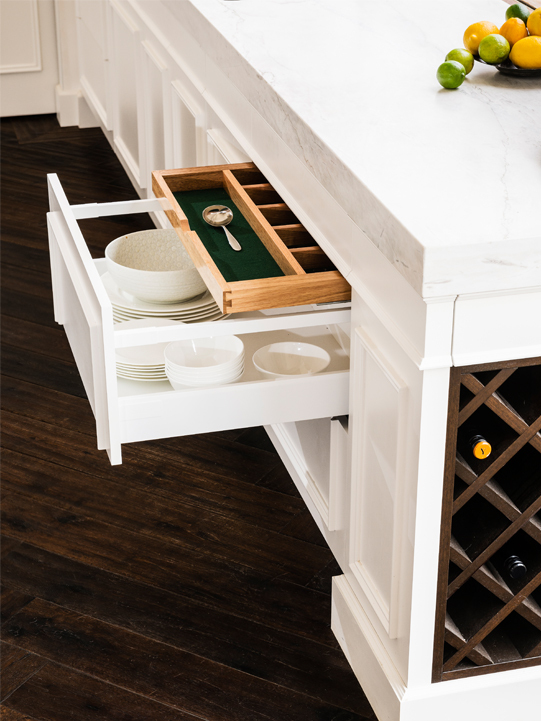 A hidden baize-lined cutlery canteen was also installed to safely store the homeowners’ precious silverware. 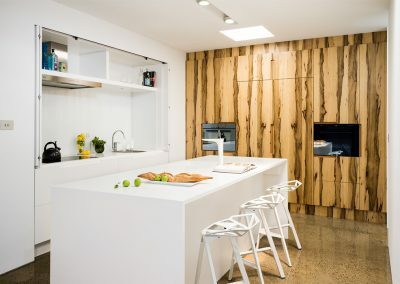 Measuring 3.6m2, the kitchen’s integrated hot-plate alcove features matching accent timber panels for a touch of sophistication. 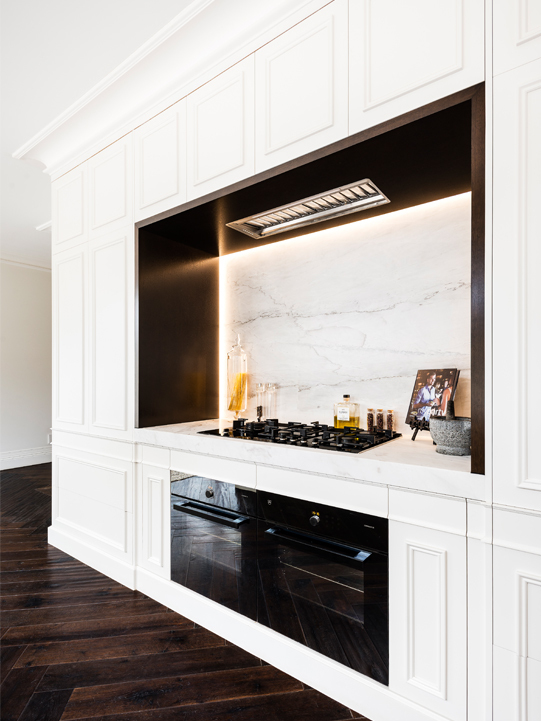 LED strip lighting highlights the luxurious marble splashback while also providing increased illumination.